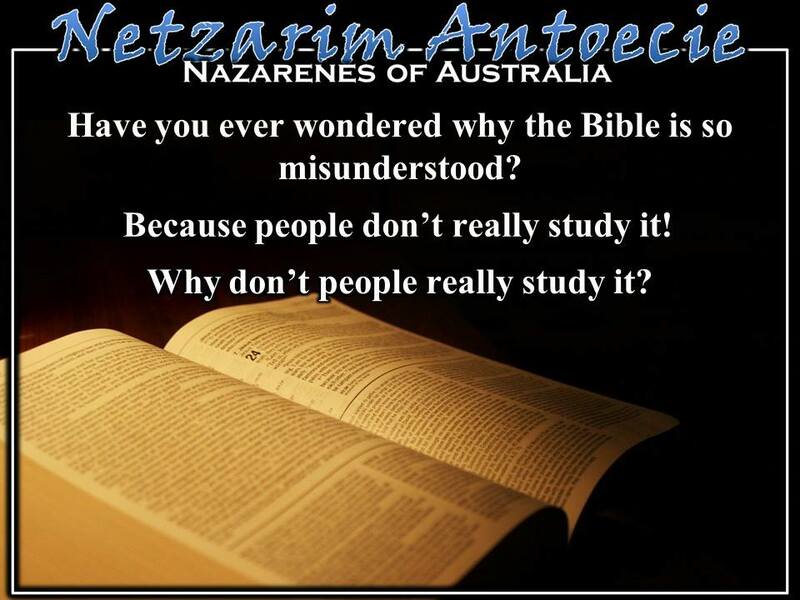 Have you ever wondered why the Bible is so misunderstood? (Slide) Because people don’t really study it. Why don’t most people really study it? Because they usually study their canned religious view of it, laying false foundation after false foundation. (Slide) The way one studies the exquisite beauty of a gemstone and the way one studies for a school test are often two totally different things. When one studies for an exam a pass of over 50% is usually the goal and when one studies a gemstone, he searches for everything in it. (Slide) The enemy (Sitre Ahura) works towards man’s miscomprehension of the Almighty’s will. “But the righteousness that is by faith says: ‘Do not say in your heart, 'Who will ascend into heaven?’ (that is, to bring Messiah down) or 'Who will descend into the deep?' (that is, to bring Messiah up from the dead). But what does it say? ‘The word is near you; it is in your mouth and in your heart,’ that is, the word of faith we are proclaiming.” (Romans 10:6-8) The Torah was never too difficult. There are those that say the Torah was too difficult for the Jews, so G-d sent Jes-s to the Gentiles to make a replacement nation, no longer concerned with Torah but fixated on grace. This is not true! 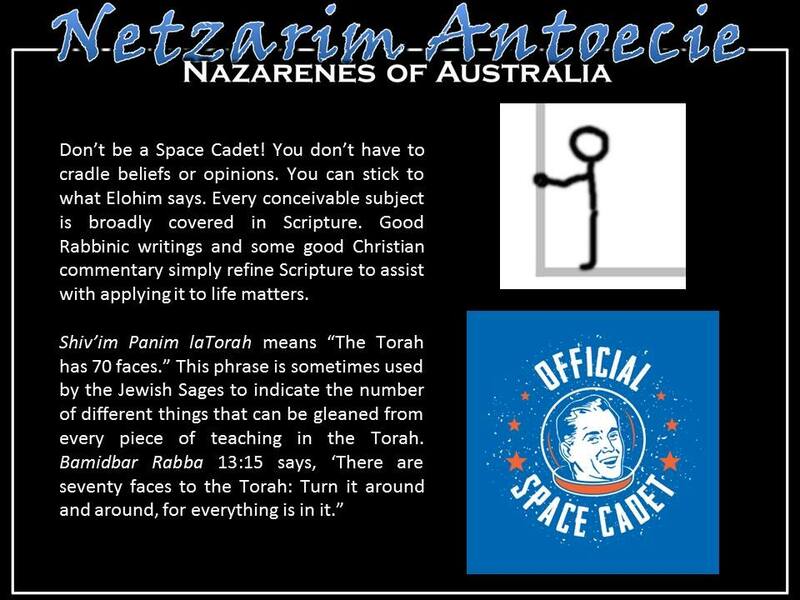 (Slide) Don’t be a Space Cadet! You don’t have to cradle beliefs or opinions. You can stick to what Elohim says. Every conceivable subject is broadly covered in Scripture. Good Rabbinic writings and some good Christian commentary simply refine Scripture to assist with applying it to life matters. P’shat – The plain meaning of the text. Remez – The Meaning which is only hinted at by the text. (Slide) Within the Netzarim community there is a great need for sufficient training in matters of Torah as it pertains to daily living. Teachings, discussions and debates on deeper matters of Torah are too frequently appearing from the same who clearly lack knowledge of basic Torah observance. “Of these things put them in remembrance, charging them before Yahweh that they strive not about words to no profit, but to the subverting of the hearers. Study to show yourself approved to Yahweh, a workman that needs not to be ashamed, rightly dividing the Word of Truth. But shun profane and vain babblings: for they will increase to more ungodliness. “(2 Timothy 2:14-16) The purpose of every Torah teaching is to dislodge barriers around the heart to allow Torah to penetrate it. The Torah is already in the mind, albeit dormant in many, but it is the heart that remains the most challenging organ. Once it takes root in the heart the Divine Service begins to be embarked upon, which truly binds the soul to Elohim. (Slide) Lamed represents the diligent learner, someone who allows knowledge to steer the heart rather than let it be swept along by unbridled emotion. (Slide) The late Rabbi Kalonymus Kalman Shapira, of blessed memory, “…had an instinctive understanding of what was profound and what was superficial in spiritual life, what was valuable and essential and what was of secondary importance.” So says the forward to his book, A Student’s Obligations – Advice from the Rebbe of the Warsaw Ghetto. Rabbi Shapira went on to sanctify Yahweh’s name in a Nazi Death camp at age 55, but during his life he stayed devoted to his calling in educating children and young men in Torah. (Slide) Rabbi Shapira’s work goes onto to list the principle ills of the soul and their cures. He even provides an exclusive chapter on a cure for laziness and a supplementary chapter called ‘Specific Advice for the Lazy.’ As such this work, though being an Orthodox Jewish publication, is a must have for every Netzarim. The idea is that we get less arguing and debating over meaningless things and more studying and learning. Another layer of assistance in this area is the wealth of knowledge contained in the Sefer Shemirath ha-Lashon (Guard Your Tongue) by Rabbi Yisroel Meir Kagan, who was generally known as Chofetz Chayim (Desirer of Life). The work itself is about the commandments relating to correct speech and the prohibitions of slander. The title of the work is taken from Psalm 34:12–15; "Come, children, listen to me; I will teach you the fear of Elohim. Who is the man that desires life; who loves days, that he may see goodness [during them]? Guard your tongue from evil, and your lips from speaking deceit; turn from evil and do good, seek peace and pursue it." (Slide) Even with his myriad of human faults and frailties, King David was called 'a man after Yahweh's own heart.' Why? What special quality did this shepherd have that earned him this description? I believe the answer is found in this verse. "Open thou mine eyes, that I may behold wondrous things out of thy Torah. (Psalm 119:118)"
(Slide) David haMelech treasured the Torah more than any other possession. He loved and thought about it day and night. Read Psalm 119 for proof of this amazing fact. David constantly prayed to understand Yahweh's Torah: to plumb the depths of each command. Remember what Rabbi Shimon Kepha wrote in 2 Peter 1:20-21, that both the prophecy and the understanding of prophecy come from Yahweh. In other words, we can no more understand a divine prophecy than we can deliver one. Both the prophecy and the understanding must come from above. So pray for understanding like King David did. It will be given you in response to your true reaction to Yahweh's Torah. You will either see or you will not see. (Slide) You will either understand, or the message will pass you by even were it thundered in your ears a thousand times. The study of Yahweh's Word, and in particular the study of His Torah, will make you humble, wise, happy and content. You too could become a man or woman after Yahweh's own heart. He will react to your innermost yearnings just as He did to King David's. He will open your eyes to see wondrous things out of His Torah. But more importantly, He will grant you the fruits of true understanding: obedience, peace, happiness and joy in your own soul. (Slide) But, hang on just one sec Cowboy! (Slide) This means that we must not read the Holy Scriptures with the sole intention of proving others wrong: if you read the Holy Scriptures with the wrong motive, it will not benefit you one iota. Most, if not all, your studies will be a waste of time. You will certainly fill your mind with facts; which you could use to bash others over the head and show them how much Scripture you know: but as far as your eternal salvation is concerned, that will profit you nothing! You'll be wasting your time. Oh the difference between finding something and eating it. It is the one that eats that gets the benefit of what he has found. Eating makes digestion and assimilation possible. When these functions are normal, the result is health and strength that aid us in all usefulness and joy of living. Your well-being depends on your nourishment and the best nourishment man can consume is the Word of Yahweh. “…desire the sincere milk of the word, that ye may grow thereby.” (1 Peter 2:2) The more of this food you can consume the better, provided you can digest and assimilate. (Slide) As you hold the Word of Yahweh in your mind, a wonderful thing begins to happen, Yahweh begins to write it on your heart. Doing this causes the Word to taste sweet to you. Quite literally, the Torah interprets all Scripture. Obscure, symbolic passages in one of its books are explained elsewhere in simple terms. As with all good instructional literature, the Holy Scripture is packed with illustrations and examples. In the first five books of the Torah we find all the laws Yahweh gave mankind through His servant Moses. Then there follows book after book of examples of how Yahweh reacts to His people's behavior regarding those laws. It's all there: the commands in the Torah, the prophetic warnings and living examples of how Yahweh reacts in the other books. You will not find many ethical decisions you have to face in life which are not dealt with in the Holy Scriptures: because Yahweh has not only told us how He wants us to live, but He has also included examples in His word of what will happen if we do not. It is folly of the worst kind to imagine that one can ignore the directions and commands of Yahweh and get away with it. Study, So That You Are Not Ashamed! (Slide) Believers spend hours arguing about doctrine. Many make the mistake of trying to find texts, which support what they think, is the truth. They conceive an idea and then spend hours trying to find texts to support it. Instead, we should study all the texts we can find on a given subject before deciding what to believe. Invest in a Bible Concordance: it will enable you to study many texts on a given subject. If time allows, look up as many texts as you can. Then, after prayerfully studying them, see what the Spirit is saying in the Scriptures on that subject. It is Yahweh's Word: and it has a great deal to teach you. The Holy Scriptures are Yahweh lamp to guide our steps: read it every day. In critical matters, that is, in those areas where a mistaken opinion could result in sin, be extra careful and tread softly. Don't delude yourself into excusing your own sins: because on the Day of Judgement - and possibly even earlier - you'll regret it. (Slide) Most Scriptural truths are portrayed on two levels. The Physical: This is the first level we humans can see and easily understand. It involves literal, physical things like nations, landmasses, trees, animals, fish, individuals and their possessions. The Spiritual: This higher level contains the real lessons Yahweh is eager to teach us. It involves concepts, principles, motives, thoughts and all the other activities, which go to make up human character. To explain lessons on this level the Master often used parables, which are stories, based on first level physical examples. By using a level one object lesson, a visual aid, the Saviour high-level truths which are normally not grasped by the human mind. “Now all these things happened unto them for ensamples: and they are written for our admonition, upon whom the ends of the world have come. (1 Corinthians 10:11)"
This means that most, if not all, the experiences recorded in the Holy Scriptures have a wider, higher, spiritual application. They occurred in those ancient days on one level; but were recorded 'for our admonition' for our learning! Because they are 'real-life prophecies' of earth-encompassing realities scheduled to take place on a massive scale in our day - upon which the ends of the world have come. (Slide) Nothing exercises the mind more than writing down what you have learned. It is for this reason that is why I try to have the notes in front of you as I preach or teach so that you can write down the questions and scriptural answers. Try to get into the habit of writing down what you have learned. Make notes in the margins of your Scriptures. Underline passages that impress you as being important. Set up your own reference system, which will point you to a preceding or succeeding text, which deals with the same subject. Do not be scared of ruining the pages: because when you write something down on paper, you are in fact writing it on your mind. Keep a Notebook and write down the things you have learned. If you have a computer, so much the better; because you will then be able to update your work regularly. (Slide) The Scripture will make one wise unto salvation. The Scripture will produce the Gift of Faith. The Scripture will reveal who the Messiah Is. The Scripture will build up your resolve. The Scripture will notify you of your inheritance. What is this text saying? It is saying that understanding will not be given to the wicked, 'none of the wicked shall understand:' but understanding is given to the righteous, to those who have been purified, made white and tried. In other words, true understanding is not a matter of human intellect, education, will power or finance. True wisdom and understanding are gifts from Yahweh to those who do His will. This means that if you really want to know, you must Trust and Obey Yahweh: and as you do this your path will become brighter and brighter as time proceeds. You will learn more and more, not only about human nature and its follies, but of Yahweh's plans, His methods and His aims and, perhaps, His motives. For you, life will not become a confused mess, as it is with so many people, but a glorious journey with Yahweh guiding your every step.